We are delighted to have our Patent-Pending Radiant Edge Standing Seam in our family of energy-efficient ice melt systems for roofs. The Standing Seam is bona fide metal roofing system designed to minimize ice dams and icicles across roof eaves where ice formations begin. 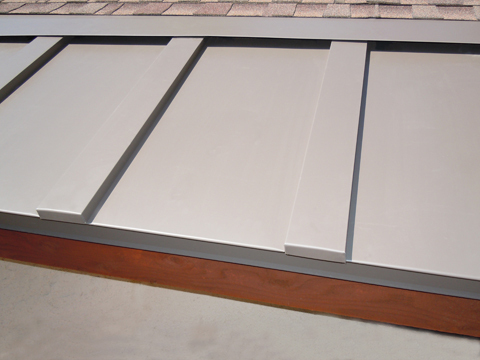 Metal roofing along roof eave edges is not a new concept. It has, in fact, become very fashionable, especially among upper-end residential and commercial projects. The intended purpose of using metal edging is to help prevent damage due to ice formations, and as an architectural statement for contemporary design. Unfortunately, typical metal edging creates an entirely new set of problems. Shingle roofing still gets torn off, often above the wall line where it causes leaks. Ice dams form and dangerous masses of ice fall off the roof unpredictably. And worse, ice dam leaks occur at the busy transition between the metal edging and the primary roofing materials. More information on this is discussed here. Summit’s history includes the manufacturing and installation of millions of feet of metal roofing in snow country. Add to that our expert resources for efficient heat transfer, and you’ve got the first true heated standing seam roof system available. Radiant Edge Heated Standing Seam is unique. Its sleek batten profile cleverly houses the heating system. No longer does one have to use exposed heat tape cable to mitigate ice issues along metal roofing. When your project calls for metal edging along the roof eaves, consider the Radiant Edge Heated Standing Seam Metal Roofing System.